10 Best Google Pixel 2 XL Cases that you MUST try! Do you own a Pixel 2 XL? It means you already have spent a good amount of money on this expensive smartphone so, why not spends some more extra bucks to make your smartphone look more classy and bump up the phone’s protection. Do you want your smartphone to look like brand new even after a year or more? If yes, it’s high time to get your hands on a case that will aid you in protecting your phone and won’t let your hand’s loose grip. Though it’s a no surprise that cases are the boon for our high-priced smartphones. You’d better buy a case for your Pixel 2 XL otherwise who knows how much you would have to pay later for your damaged phone. With a high-priced big 6-inch screen, a case is highly recommended. The Google Pixel XL is a beautifully crafted phone with sharper 5.5-inch QHD AMOLED display and more battery life which makes it even more appealing than Samsung Galaxy Note 7 (ahem ahem!). Unfortunately, the aluminum and glass which mainly comprises this lavishly expensive not-so-durable phone can slip out of your fingers (especially if you’re popularly believed to be having butterfingers) it’s far better to buy a cheap $20 case than paying $250+ to repair a broken phone. Undoubtedly you will want to flaunt your cherished belonging, but you will also have to shower concern over the fact that this phone needs to shielded from accidents since it costs around $769-$1000! So let’s have a glance at ten most spectacular cases for this precious human-made creation! Now figuring out the best one or worst one has become laughably easy for you. Search Pixel 2 XL cases on Amazon, the Vault shows up as one of the very first results with an “Amazon’s Choice” banner. Although it is a TPU shell case, it stands out from the rest of the reasonably reasonable cases because of its sophisticatedly brushed aluminum finish and carbon fiber highlight surrounding the camera. Providing sufficient level of protection to the Pixel XL, and costing around only $11.99. 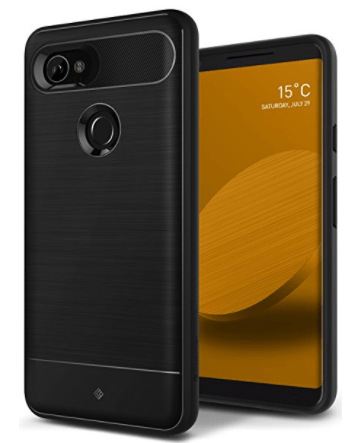 Astonishingly, being Caseology’s most reasonable Pixel 2 XL case, it is also conferred with a MIL-STD 810G rating. The only downside of this stylish case is its color options, which is only black. These amazing cases are crafted out of a specific fabric which covers it from the outside and makes the device grippy. A microfibre liner on the inside prevents the phone from getting any gruesome scratches. There are four distinct color options to choose from- Carbon, Coral, Midnight and Cement. The case is quite compatible with the Active Edge feature of Google that allows the user to activate the Assistant by gently compressing the sides of the phablet. There’s even a silicone G logo on the back of the case. It costs around a whopping $40, but it is worth a buy. There are uncountable wooden cases for both Pixel and Pixel XL, but none can match the whimsical authentic (made exclusively and solely from) wood. A company based out of Pittsburgh, Pennsylvania, it’s carved these handcrafted cases out of a single block of wood for each case. The high-quality product is quite expensive though, and I can provide you with the assurance that it is worth the money. Also, in case you break this case, not to worry because it can be sent for repairing and that too at no charges imposed on you. The KerfCase buttons are one of the most easy to use buttons available. 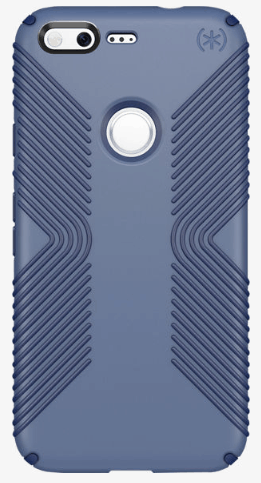 Why not add some additional stylistic features to your Google Pixel 2XL Case? The Maxboost PU leather wallet not only safeguards your phone from various angles and all the sides but also holds up three to four cards as well as some cash, in case you want to opt for a minimalist approach of living. In short, it easily replaces your wallet. The case is closed with a magnetic clasp and surprisingly, costs only around $10! loved for its excellent resistance to heat,” According to its website. The integrated magnet on the back is sort of appealing, but one will have to pay an extra ten bucks to get the mount from PITAKA. Quite grippy and durable, the case has a matte finish to it. There are cutouts at the back to expose the camera, flashlight, and a fingerprint sensor. This one is a rockstar! It is a combination of a polycarbonate outer shell, a Tensor processing unit sleeve which is at the back and is also a shock absorber. Not to forget to mention, a built-in screen protector which provides safety at every nook and corner. It also provides the user with an optional 360-degree belt clip holster. It is a brilliant case which is an amalgamation of hard as well as soft TPU material. To prevent the entrance of moisture or dirt, fine pieces of plastic coverings around the microphones, fingerprint sensor, and speaker are put. A stiff plastic flap safeguards the USB-C port and built-in plastic screen protector. In short, it protects your expensive phone from all angles and aspects. Lifeproof FRE Waterproof Case is water resistant (it can survive around 6 feet of water for one hour), the black case is dirt-proof, dust-proof, and even drop-proof! It costs around $62.99. This case literally is a shield which protects your phone despite it falling from a height of 10 feet. I think that alone qualifies it for it’s spot on the list of best google Pixel 2 XL cases. While it is soft and squishy from the inside, it is as hard as a shell from the outside and has rubber grooves and ridges which provides a firm grasp. Speck does offer variations like the pink with glitter sprinkled on it, graphite grey, charcoal grey, eclipse blue, carbon black, and surf teal, and Mykonos blue. Costing around $22.49, it is cushioned by elevated bezel around the screen. Want to flaunt your glorious Pixel XL but at the very same time, shield it from damages? Well then this case from Spigen makes it to the number 9 spot on our list of best google Pixel 2 XL cases for one reason! Spigen Liquid Crystal is perfect for you! It’s “ergonomic” structure allows swift fingerprint recognition whereas the back of the case is almost transparent and watermark free. Costing approximately $10.99, the phone’s buttons are enveloped but easy to press, and the front of the case is raised to in order to keep the screen protected when the phone is placed face down. This modish and sophisticated leather case is a relief from those quintessential plastic cases. This is one of the best google Pixel 2 XL cases made out of sturdy polyurethane which makes it easier to hold the phone in case you have butterfingers. Not only this, but also the case is available in three unique color options: Black, Dark Coffee, and Pink-Gold option. Costing around $11.98, the denim lining protects from scores and other damages. The bottom opening provides viable access to headphone jacks as well as ports. Not only will these cases provide a protective shield to your device, but will also cast a spell on the onlookers because of its stylish and alluring texture. Google knows that developing a brilliant phone such as Pixel XL is a beautiful way to capture the hearts of technophiles. In short, Google Pixel XL along with the case (which are aforementioned) will make an excellent duo which will smoothly sail through all the expectations and emerge victoriously. If you have any other case that you think should make the top 10 best Google Pixel 2 XL cases list then leave them in the comments down below! And if you want to give your Pixel 2 XL some customization from the software side of things then do click on this link!